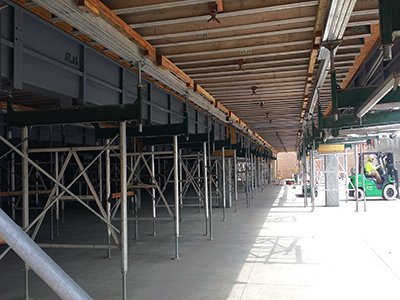 Atlas offers approaches for beam and slab post- tensioned parking structures where equipment can be cycled in applications ranging from totally handset to totally pre-fabricated. Deck joists are typically designed to clear span in structural bays of up to 21' in width. This not only eliminates the labor-intensive activity of center-bay post shoring, but also streamlines the reshoring requirement with regard to both equipment and labor costs. Atlas also owns the GBS form, a comprehensive system designed to provide an economical, poured-in-place, multi-story parking garage. 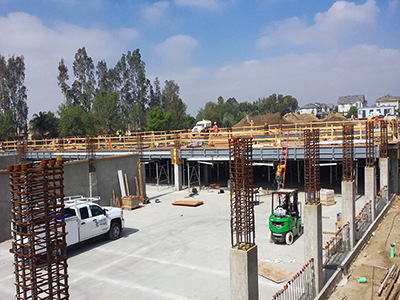 The Garage Beam System is a complete concrete forming system for post-tensioned concrete beam and slab parking structures. This system includes design and structural suggestions that simplify formwork and reduce related concrete construction costs. The system consists of long steel beam form assemblies, high-capacity leg supports, column and capital forms, and reusable deck panels. No tie system or bracing is required for this specialized forming application. Span up to 22' without center shoring. All of the Garage Beam components are quickly handled and moved with forklifts and wheeled dollies for maximum productivity.